Vintage garments are our windows to the past. 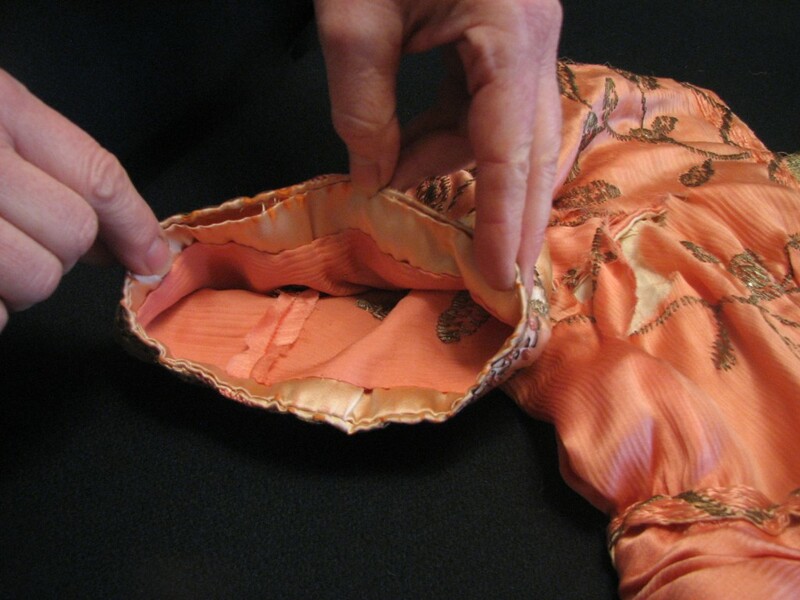 In them we can discover the techniques of early designers and dressmakers. 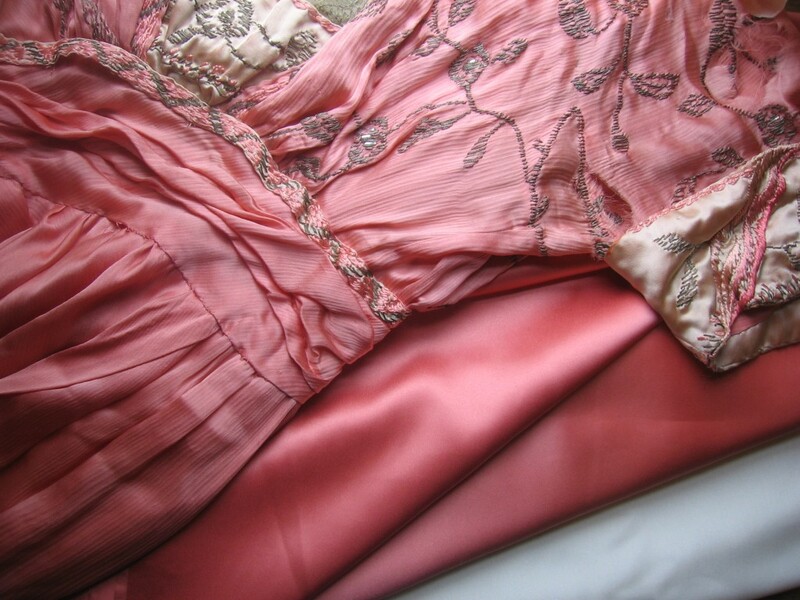 Since I value each garment as an original source for research, I am reluctant to do anything to an original vintage garment that would destroy that information. However, some time ago I had a client approach me with an intriguing project: could I replicate a Paris original, circa 1912, salvaging the primary elements that made it a true work of art? 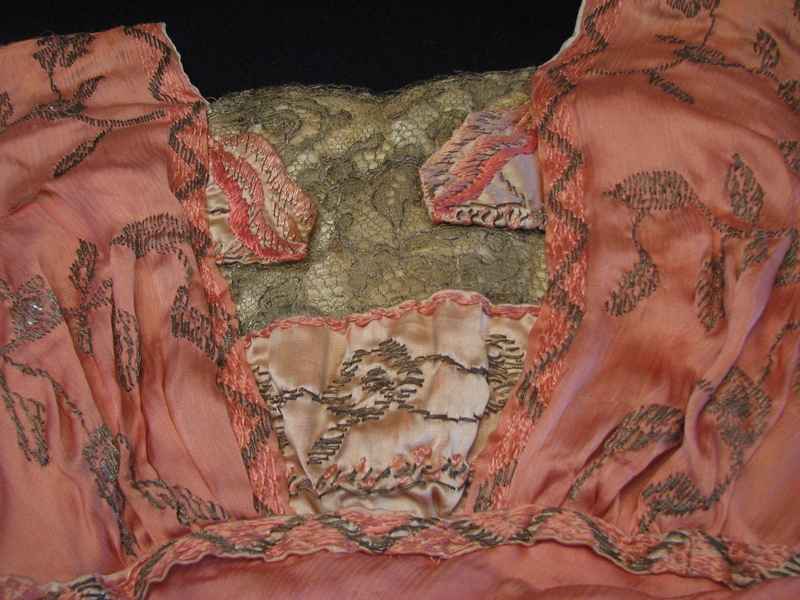 However, this particular garment was damaged beyond any change of wearing or even exhibiting it. 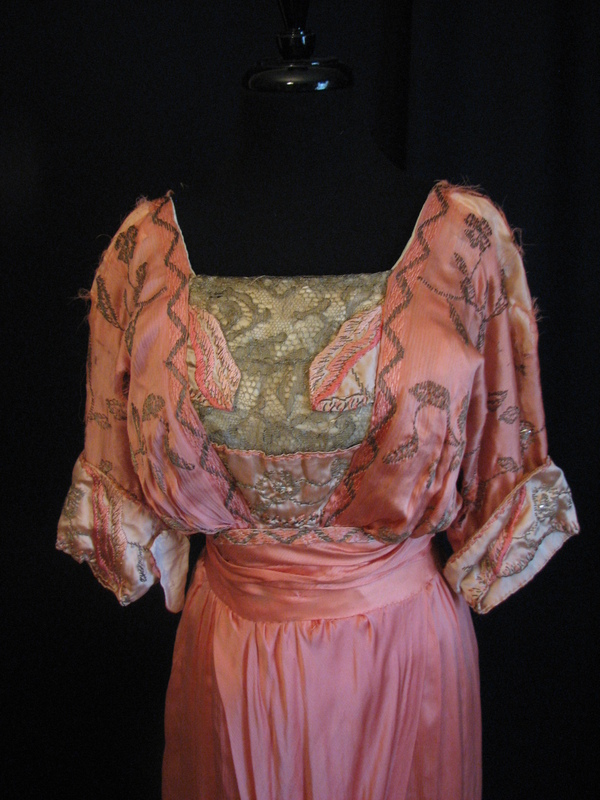 The bodice had worn away on the shoulders. 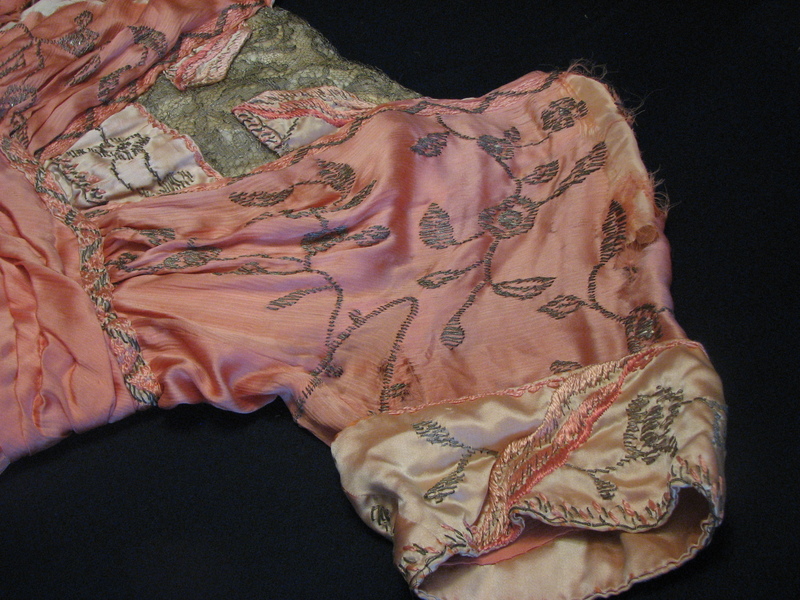 Sections of it were in shreds, probably due to the weight and roughness of the beautiful metallic embroideries. Sometime in the past, someone had cut away a section of the skirt, probably to use the rich embroideries as a home décor item. The skirt was ruined. And finally, the client wanted to wear it but couldn’t in its current condition. It was a size too small. The tops of the sleeves had worn away. The silk in the bodice was shattered. I agreed to take on the challenge. 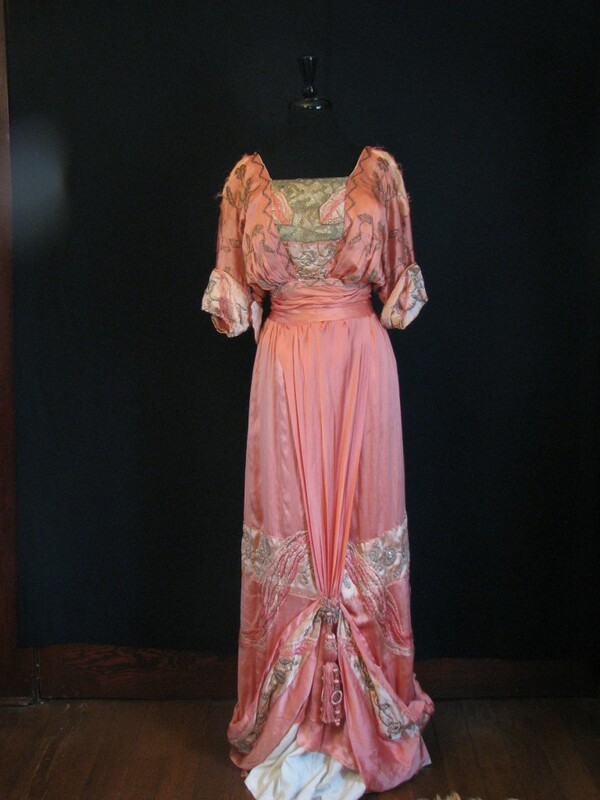 Along the way I documented the original gown as well as I could so that I would have a record of the 1912 Paris couture techniques that were used in the original. Here is what I recorded. The hand embroidered trim continued into the lower back sections. 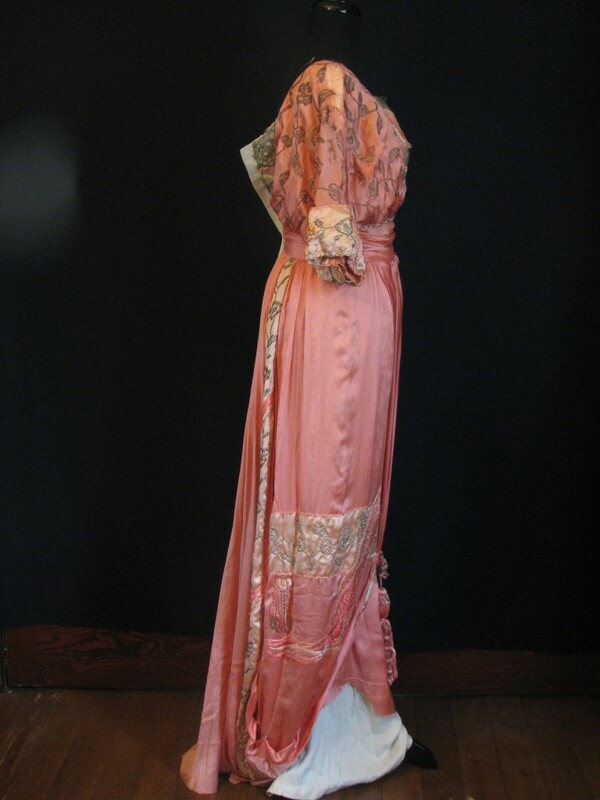 I thought of those early Parisiennes, spending their days under skylights in ateliers to create this gown. 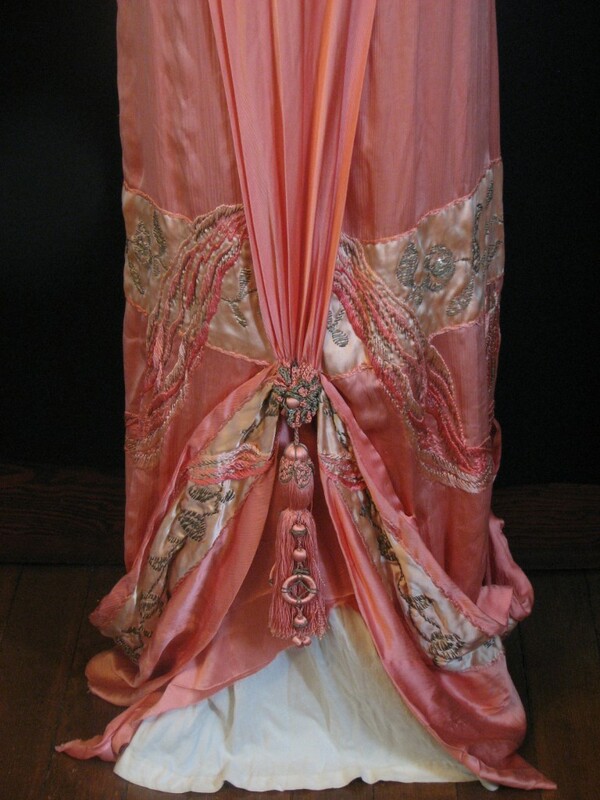 The front of the gown, with its intricate draping and ornate tassel, was one of its most beautiful features. 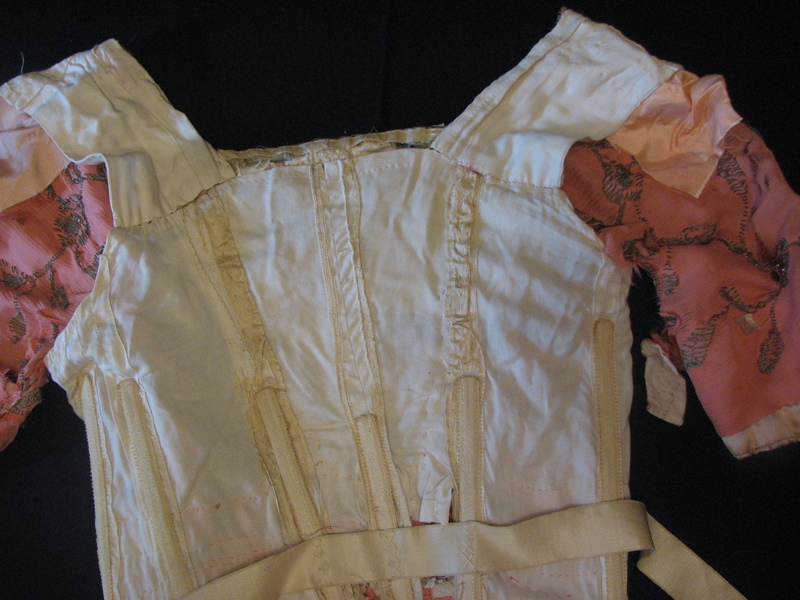 The inside of the bodice showed 19th century construction and boning. 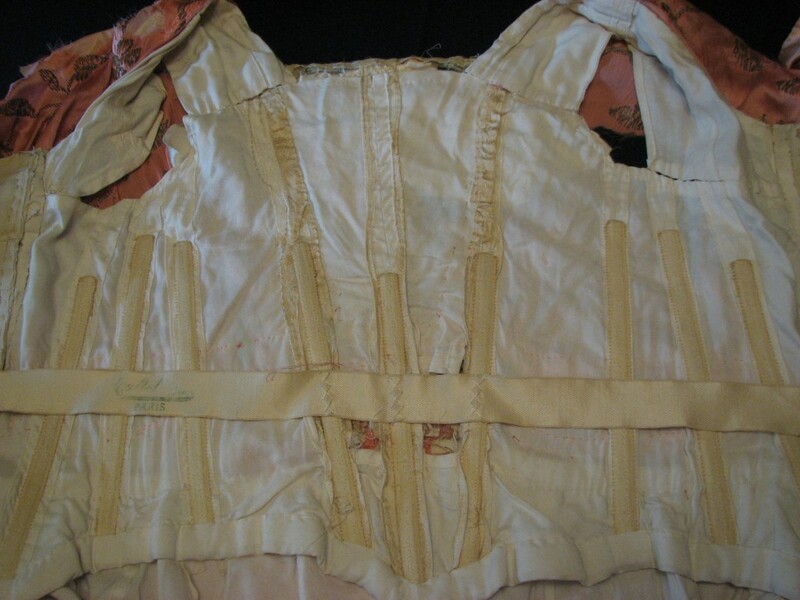 The shoulder straps had been attached by hand, using whip stitches… probably after a fitting. 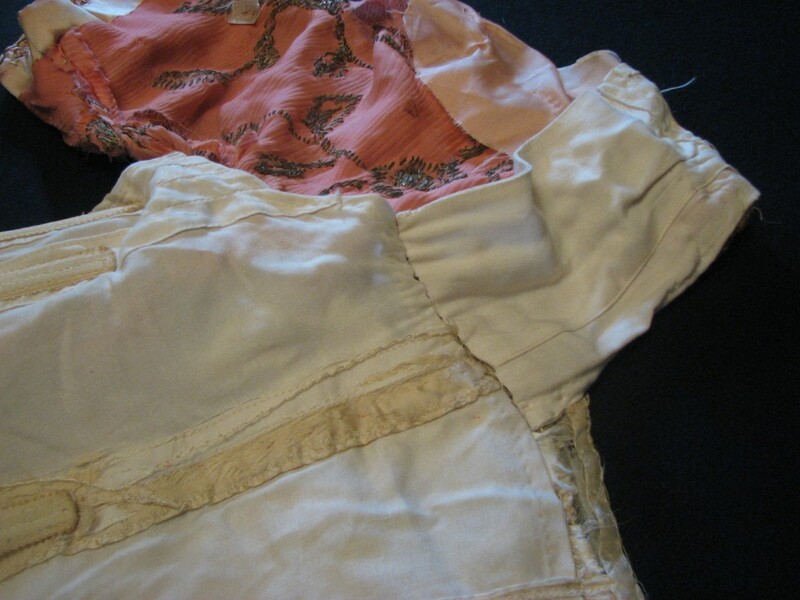 The inside of the sleeve shows the layers of fabric and the method of slip stitching them together. 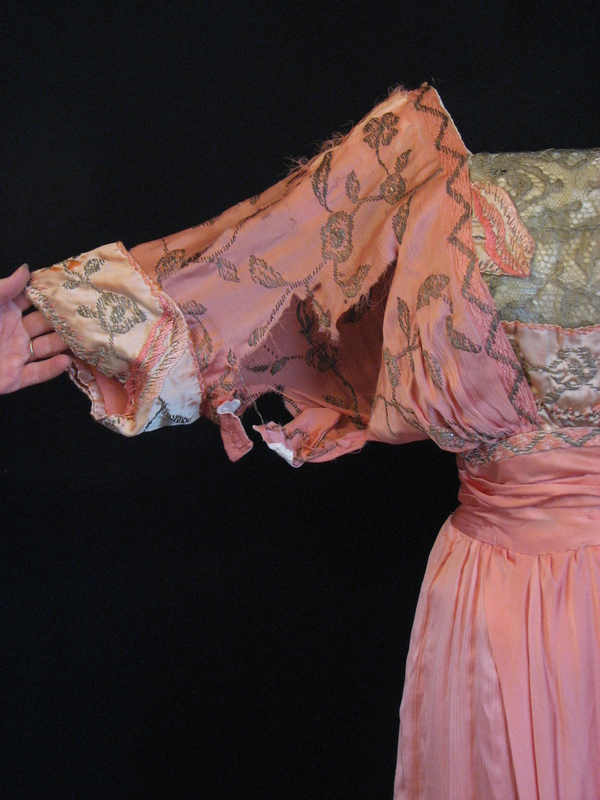 The outside layers of the bodice were constructed over the boned foundation, giving the appearance of a soft kimono sleeve over the lace insert. Under the arm, a gusset gave additional wearing ease. 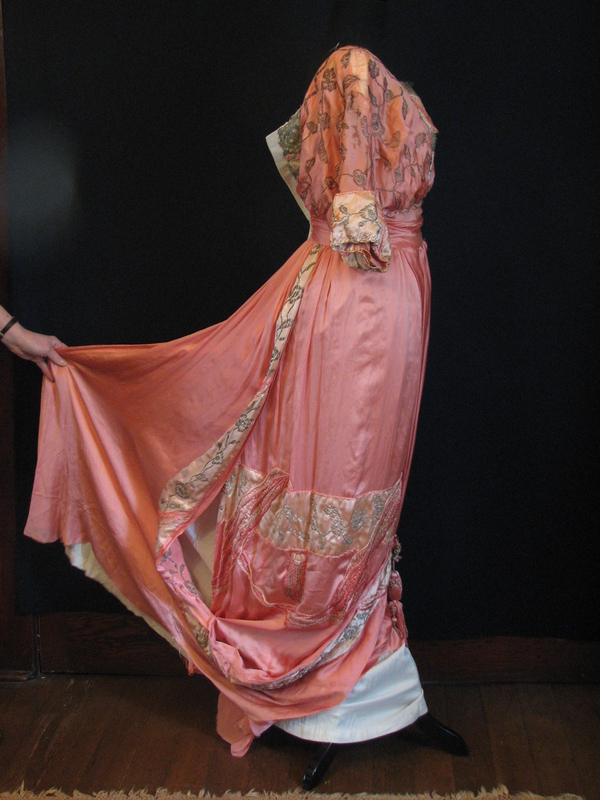 In my next post, I will share the step by step process of recreating the 1912 gown, using new materials where necessary and the original luxurious fabric where possible. This is gorgeous – thank you for documenting this gown! As someone who’s just started becoming involved with recreating historical embroidery patterns I love seeing extant examples. Wonderful post. I learn something interesting from different blogs everyday. Thanks for sharing. I am very pleased to find your blog. I wanted to say thanks for the time you spent on this wonderful post! I definitely enjoyed reading it and I have you bookmarked to check out new blog postings you create!